Many workers are injured and killed each year due to asphyxiation. They find themselves, quite without warning, unable to breath or breathing in poisonous gases or hazardous contaminants – especially while working in confined spaces or industrial environments. The outcome of employee exposure to such atmospheres at work can range from fatalities to acute or chronic ill health. HSE statistics show that ill health is the biggest cause of days lost at work, and deaths from workplace injury and ill health are dominated by respiratory disease – accounting for 99% of all workplace deaths. Most of the fatalities have been among the would-be rescuers who were untrained and unprepared. A confined space can be more hazardous than regular workspaces for many reasons other than gas related complications. To effectively control the risks associated with working in a confined space, a confined space hazard assessment and control programme should be implemented for your workplace. This programme should be put together after reviewing the specific regulations that apply to your workplace. When the breathing environments cannot be made safe during work, suitable Respiratory Protective Equipment (RPE) plays an important role in helping the workers and rescuers in successfully completing their job by protecting them from the risk of asphyxiation. Respiratory Protective Equipment is a particular type of Personal Protective Equipment (PPE), used to protect the individual wearer against inhalation of hazardous substances in the workplace air. RPE should only be used where adequate control of exposure cannot be achieved by other means. PPE stands as the last step on the hierarchy of control measures and hence should be used as a last resort. Employers must firstly attempt to eliminate the hazard at source. RPE should only be used after all other reasonably practicable control measures have been taken. 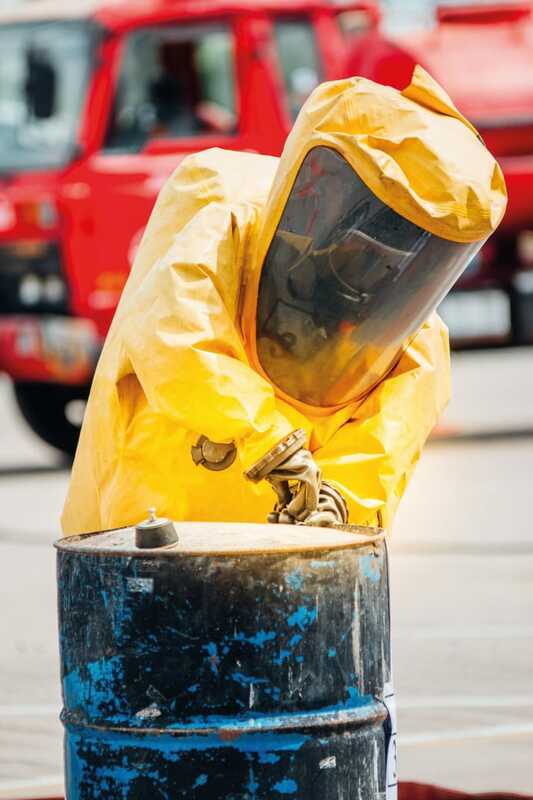 PPE is considered a last resort because it only protects individual workers, is prone to failure or misuse, such as wearing the wrong RPE for the job, and employees wearing RPE may get a false sense of security when using RPE. It is a well known fact that there is a well established health and safety framework in every developed and developing country including US, UK and Europe. All these regulations require the provision and assessment of PPE in the workplace. Employers shall determine the conditions of use of PPE, in particular, assessing the adequacy of PPE selected. An employer shall ensure that the use of an item of PPE provided is normally confined to one employee. 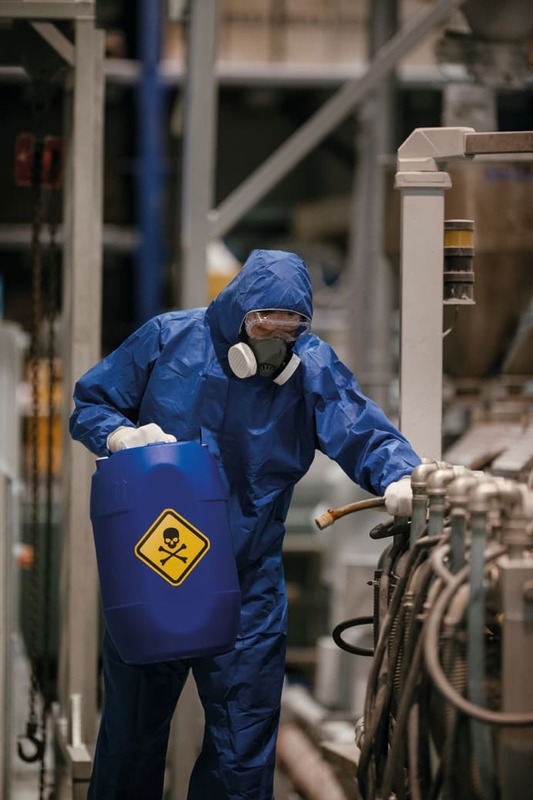 Where it is necessary for RPE to be used by more than one employee, arrangements should be made by the employer to have RPE cleaned and disinfected before use by another individual. Personal Protective Equipment is required to be maintained and replaced appropriately. Other than this, an employer must provide information, training and instruction for all PPE provided for use by an employee. The employer is also obliged to ensure that there is adequate supervision provided. The RPE must be provided without charge. The regulations also set out the requirements for safety signs which must be used at all workplaces when hazards cannot be avoided or adequately reduced. There are two types of RPE that are commonly used in the workplace: filtering devices and breathing apparatus device types. The correct selection of appropriate RPE for the task undertaken is one of the most important steps in ensuring an effective health and safety management. Failing to select, fit-test, use, store and maintain correct RPE will lead to exposure of hazardous substances at work. Using incorrect RPE can potentially lead to workplace fatalities in areas of low oxygen concentration or confined spaces for example. This article is more focused on breathing apparatus. Breathing apparatus (BA) is RPE worn by rescue workers, firefighters and others to provide breathable air in hazardous environments technically known as Immediately Dangerous to Life or Health (IDLH). A multi gas detector may show very high levels of toxic and flammable gases in these environments that can kill humans in no time if entered unprotected. The breathing air is supplied to the BA either from a safe environment away from the work zone through a long hose powered by a pump or from a dedicated oxygen cylinder or compressor. A range of different types of BA exist, namely fresh air hose, airline, and demand valve. Powered air purifying respirators, supplied air and self containing breathing apparatus are all positive pressure devices. The pressure on the inside of the respiratory inlet exceeds the ambient air pressure outside the respirator. As a general rule, positive pressure devices are used for more hazardous exposures. The specific breathing apparatus designed for use under water for the use of diving and other activities is called SCUBA or self-contained underwater breathing apparatus. SCBA typically has three main components: a high-pressure tank, a pressure regulator, and an inhalation connection sometimes referred as mouthpiece, mouth mask or face mask, connected together and mounted to a carrying frame. A self-contained breathing apparatus may fall into two different categories known as open circuit and closed circuit. In closed circuit breathing apparatus the exhaled gas gets filtered, supplemented and re-circulated again to the user. This type is also known as re-breather type breathing apparatus. This type of breathing apparatus is used when a longer-duration supply of breathing gas is needed, such as in mine rescue and in long tunnels and going through passages too narrow for a big opencircuit air cylinder. Re-breathers used underwater have the advantage of not releasing tell-tale bubbles, making it more difficult to detect divers involved in covert operations. Open-circuit industrial breathing sets are filled with filtered compressed air rather than pure oxygen. Typical open-circuit systems have two regulators; a first stage to reduce the pressure of air to allow it to be carried to the mask, and a second stage regulator to reduce it even further to a level just above standard atmospheric pressure. This air is then fed to the mask via either a demand valve, which activates only on inhalation, or a continuous positive pressure valve that provides constant airflow to the mask. The major application areas for SCBA are fire fighting and industrial use. It is also used in the medical field, for example; the American National Institutes of Health prescribes the use of SCBA for medical staff during the treatment of Ebola. SCBA designed for firefighting purposes tends to be expensive because of the exotic materials used to provide the flame resistance and also, to some extent, to reduce the weight penalty on the firefighter. In addition, modern firefighting SCBAs incorporate a PASS device (personal alert safety system) or an ADSU (automatic distress signal unit) into their design. These units emit distinctive high pitched alarm tones to help locate firefighters in distress by automatically activating if movement is not sensed for a certain length of time, typically between 15 and 30 seconds, also allowing for manual activation should the need arise. In firefighting use, the layout of this breathing set should not interfere with the ability to carry a rescued person over the firefighter’s shoulders. The industrial uses of SCBA are generally to protect the workers from contaminated breathing environments and rescue in confined spaces. Historically, mining was an important area, and in Europe this is still reflected by limitations on use in the construction of SCBAs of metals that can cause sparks. Other important users of SCBA are petrochemical, chemical, and nuclear industries. 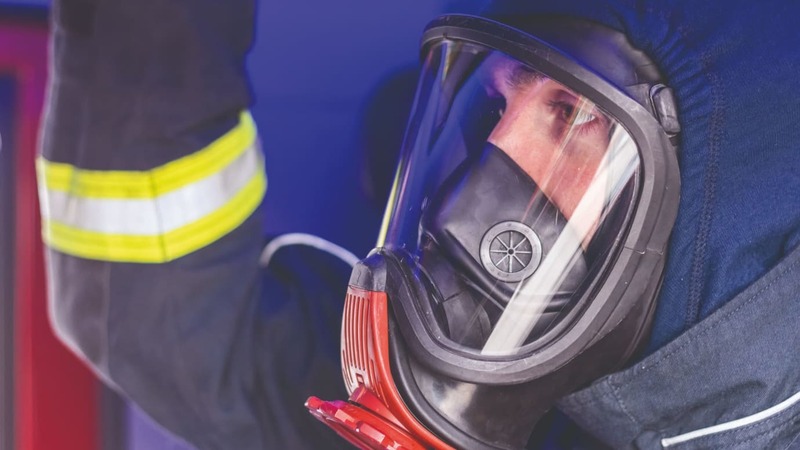 The design emphasis for industrial users depends on the precise application and extends from the bottom end which is cost critical, to the most severe environments where the SCBA is one part of an integrated protective environment which includes gas tight suits for whole body protection and ease of decontamination. Industrial users will often be supplied with air via an airline, and compressed air will be used only for escape or decontamination purposes. In the United States, SCBA used in firefighting must meet guidelines established by the National Fire Protection Association (NFPA) Standard 1981. If SCBA is labelled as “1981 NFPA compliant” it is designed for firefighting. The current version of the standard was published in 2013. These standards are revised every five years. 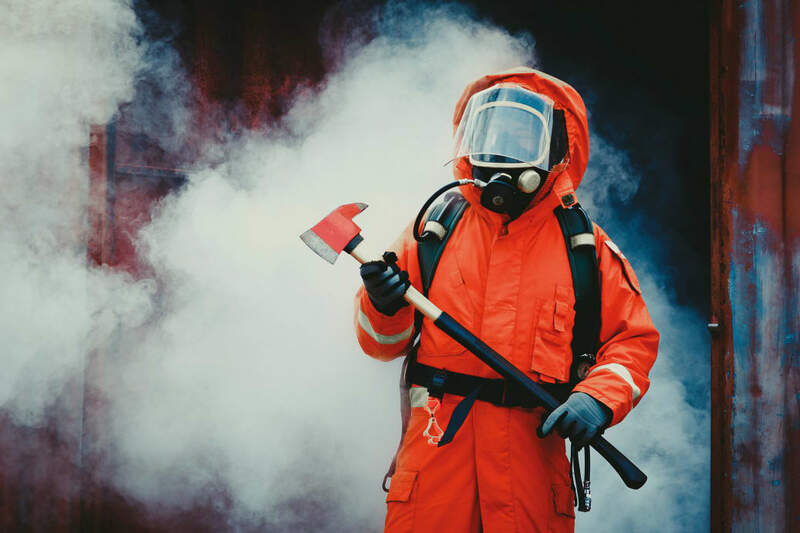 Similarly, the National Institute for Occupational Safety and Health (NIOSH) has a certification programme for SCBA that is intended to be used in chemical, biological, radiological, and nuclear (CBRN) environments. Any SCBA supplied for use in Europe must comply with the requirements of the Personal Protective Equipment Directive (89/686/EEC). In practice this usually means that the SCBA must comply with the requirements of the European Standard EN 137:2006. This includes detailed requirements for the performance of the SCBA, the marking required, and the information to be provided to the user. The two recognised classes of SCBA are Type 1 for industrial use and Type 2 for fire fighting. Any SCBA conforming to this standard will have been verified to reliably operate and protect the user from -30 °C to +60 °C under a wide range of severe simulated operational conditions. What gas is used in BA? A breathing gas is a mixture of gaseous chemical elements and compounds used for respiration. Air is the most common natural breathing gas, but other mixtures of gases or pure gases are also used in breathing equipment. Generally, breathing gases are used in equipment such as scuba equipment, surface supplied diving equipment, decompression chambers, submarines, space suits, spacecraft, medical life support and first aid equipment, high-altitude mountaineering and anaesthetic machines. Oxygen is the essential component for any breathing gas, at a partial pressure of between roughly 0.16 and 1.60 bar at the ambient pressure. The oxygen is usually the only metabolically active component unless the gas is an anaesthetic mixture. During metabolic processes some of the oxygen in the breathing gas is consumed and the inert components are unchanged, and serve mainly to dilute the oxygen to an appropriate concentration, and are therefore also known as diluent gases. Most breathing gases therefore are a mixture of oxygen and one or more inert gases. Other breathing gases have been developed to improve on the performance of ordinary air by reducing the risk of decompression sickness, reducing the duration of decompression stops, reducing nitrogen narcosis or allowing safer deep diving. The technique that is used to fill diving cylinders with gases other than air is called gas blending. Here’s a question for you: can you fill your breathing apparatus tank with pure oxygen? The answer, is a resounding no! Oxygen becomes rapidly toxic at depth and prolonged exposure to pure oxygen below a few metres can kill you. It is not an appropriate scuba tank gas mixture. Technical divers use pure oxygen on carefully-calculated decompression dives, but this is beyond the scope of recreational diving and should not be attempted. Oxygen is also highly reactive and can make other substances flammable. Safety training is necessary to work with pure oxygen. The cylinder contains about 1,240 litres of compressed air at 200 atmosphere pressure. This gives the wearer around 31 minutes of air supply for full usage or about 21 minutes for working conditions. This is due to the person breathing heavily during work and hence increasing the consumption of air. The reducing valve reduces the pressure by about four bars, which is further reduced by the demand valve that is attached to the mask. The demand valve is the one that supplies the air to the wearer when inhaling. The exhalation valve releases the air from the facemask. When the air left inside the apparatus will last about 10 minutes (40-45 bar pressure), a warning whistle is sounded continuously until the cylinder gets emptied. The start of this whistle is an indication for the wearer to move out of the space he/she is in. The face mask is of soft moulded natural rubber and five adjustable head straps and a nylon lanyard or neck strap. It is foam filled or has an air cushion seal and a full vision visor. For correct positioning of the mask, the straps should be tightened in the sequence where the first two upper straps then the middle pair and finally the lower pair are tightened. Care should be taken to not over tighten them causing discomfort to the wearer. The mask is made of rubber and plastic with a shatterproof visor. It has an exhalation port with a speech diaphragm and a nose guard. The wearer should have a good, clear field of vision through the visor. A gauge is provided, clipped or attached to the harness that carries the cylinder and it monitors the pressure within the cylinder; it is positioned to be visible to the wearer. Spare cylinders must be provided for each set of breathing apparatus and a small air compressor provided onboard to refill the cylinders with compressed air. In the case of the facemask being dislodged in a toxic atmosphere, the wearer should hold their breath and position the mask correctly. Any inlet of such toxic air can be highly dangerous. It is important that you know how to calculate your consumption rate, and then be able to calculate the duration of the breathing apparatus you are using. As a rule, 40 litres per minute is the industry average for consumption. Factors that affect consumption rate are the user’s lung volume, fitness, effort and experience levels, as well as whether they smoke or suffer claustrophobia. The SCBA sets must be checked routinely and maintained to keep them in working order at all times. Examine all breathing apparatus and cylinder gauges to confirm they are in the correct pressure range. Check the back plate and the shoulder/waist straps for any damage and keep these straps and belts fully stretched. Check the facemask straps and other rubber parts for any deterioration. Wipe the mask with a mild disinfectant and rinse under running water. Perform pre-user checks after every maintenance as mentioned in the manufacturer’s manual. Alwyn Mendonca is a practicing Health, Safety and Environment professional in Dubai, United Arab Emirates. He is a member of the Institute of Occupational Safety and Health (IOSH) at graduate level, and has been in the field for 22 years.